Every year at the Esri Developer Summit (DevSummit) in Palm Springs, California, Jennifer Swift can be seen ducking in and out of user presentations, sitting rapt in technical talks, and talking shop with colleagues while walking the halls of the convention center. She often has two or three wide-eyed conference neophytes in tow—her students from the University of Southern California’s (USC) Spatial Sciences Institute (SSI). In a conference center full of strangers and people who only see each other once a year, their esprit de corps can be infectious. Yet sometimes, it’s the first time these students have ever met Swift or each other. Swift, an associate professor of spatial sciences (teaching) at SSI, teaches undergraduate students in the residential USC GeoDesign program, as well as Geographic Information Science and Technology (GIST) courses to USC master’s students—all online. Her graduate students, who are generally a few years or more out of college and have significant work experience, span the United States. But with a dose of persistence, Swift convinces a handful of them to travel to Palm Springs each year to present their GIS work at DevSummit. By taking the time to talk her students into going—sending a mass email first, then personally following up with all her best programming students from the previous year—she can usually persuade four to six of them to attend the summit. “It always amazes the other faculty because we don’t pay—the students have to pay for everything,” she pointed out. Even so, over the years, Swift has had 20 students present at DevSummit, 38 demonstrate their work at the Esri User Conference, and many more exhibit at other conferences across the United States. Swift ensures that they get those opportunities as well, facilitating meetings between her students and Esri staff from around the world and posting photos of the job boards online for them to peruse. She also fosters camaraderie among the normally geographically dispersed students, encouraging them to attend one another’s presentations and, once, even participating with them in the summit’s much-anticipated closing activity: a curiously competitive dodgeball tournament. Their sporting missteps notwithstanding, Swift is devoted to making sure that all her students flourish. “And she’s doing it online, which is even more difficult,” said Gould. But Swift, who is currently the program director of the institute’s Esri Development Center, seems to be a natural at facilitating distance learning. “Online students are happy if you just respond…if they don’t feel like they’re alone out there,” she said. Her ability to give students this kind of attention, despite not being in the same location, may very well stem from how she got her PhD. After completing her undergraduate degree in geochemistry at Bowling Green State University in Ohio, attaining a master’s degree in geology from the University of Northern Illinois, and getting some work experience in consulting, Swift jumped at an opportunity to get her PhD in geophysics at one of Turkey’s top universities while studying the North Anatolian Fault—without knowing a lick of Turkish beforehand. She took Turkish language classes on weekends and eventually gained fluency. But all the curriculum at Bogaziçi University was in English. Her research team spoke English, too. And that’s what really drew her to Turkey—the chance to study the fault zone, which is similar in structure and behavior to Southern California’s San Andreas Fault system but, by comparison at the time, offered new and unique opportunities for earthquake studies. Whenever there was an earthquake in the area, she and the team from the university’s Kandilli Observatory and Earthquake Research Institute would pack all their stuff up and drive, for example, to eastern Turkey, where they would conduct field reconnaissance for weeks, using GIS for some of the work. Other teams would be flown in from all over the world, especially the United States. After receiving her PhD and teaching in the observatory at the university for three additional years—spending a total of nine years in Turkey—she used the contacts she met there out in the field to get her first projects when she returned to the United States. Which is exactly what happened. After tossing up a few employment ideas, she ended up taking a postdoctoral research position at USC. “The professors who were inviting me were very well-known, and I thought, if I don’t do this now, I may not get another chance,” she said. Swift started out doing small research projects in USC’s civil engineering department, where she learned and kept up with Esri technology. She ended up also team teaching an online course for the geography department and then switched to it altogether—just as geography at USC was undergoing a major transformation. The department only had a few full-time faculty at the time, and in lieu of rebuilding it, the university elected to establish SSI in 2010. In 2011, Swift became its founding director of graduate studies. 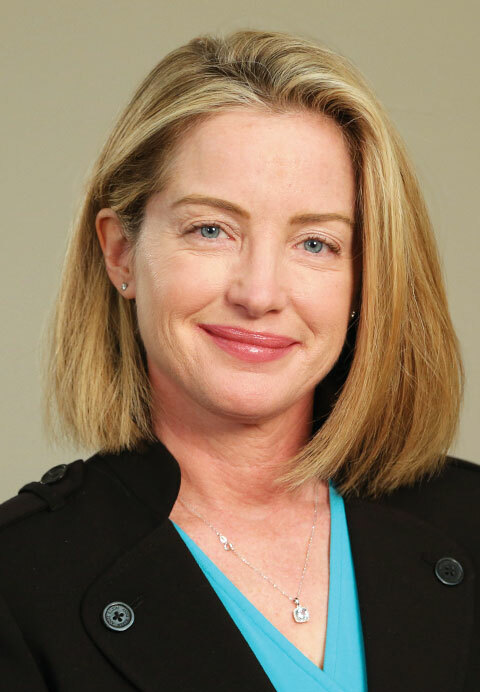 “The position was based largely on my effort to support [SSI director] John Wilson and all the faculty in the initial creation of the institute,” she said. 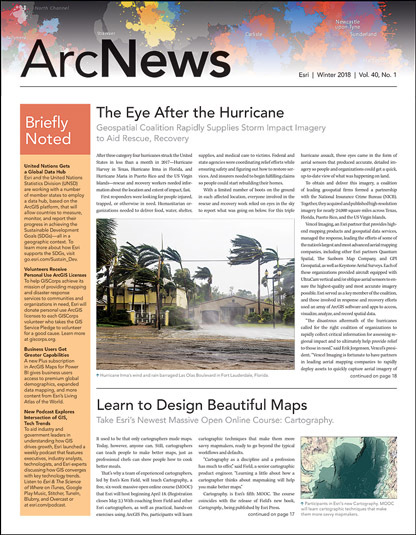 Being extremely well versed in USC’s online learning platforms, such as Blackboard, plus Esri technology, Swift wrote a great deal of documentation to make it easier for faculty to teach. According to both Kemp and Gould, that is where Swift really shines—not only in setting up enterprise systems, though, but in teaching enterprise GIS as well. 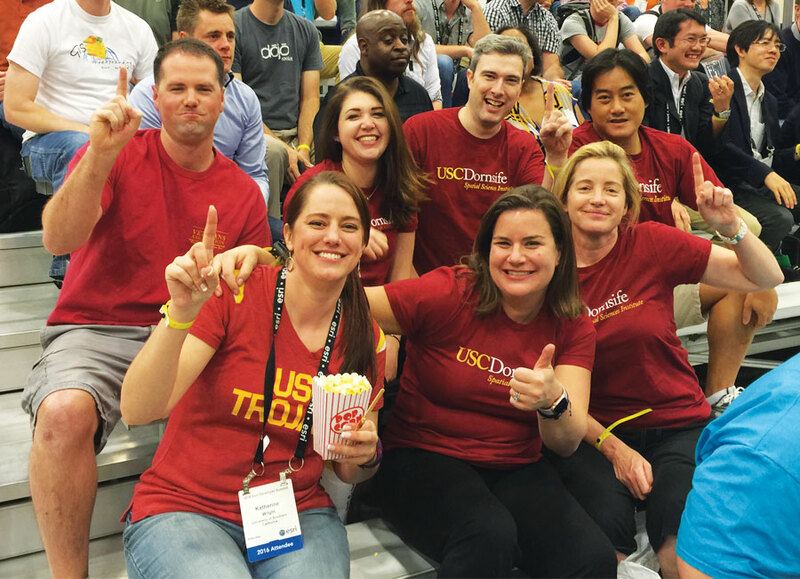 Jennifer Swift (front right) with some of her USC master’s students at the 2016 Esri Developer Summit dodgeball tournament. “She’s been essential in having our enterprise GIS roll out as well as it does and in making sure that it addresses the needs of our students, which is what it’s for,” said Kemp. “She’s been a pioneer in utilizing cloud computing and virtual machines so that each student has their own environment to experiment with,” remarked Gould. And somehow, Swift has figured out how to teach such a complex subject to students no matter where they’re located or how competent they are in coding. “She believes it’s possible to teach this stuff—this really difficult, abstract, technical material—to everybody,” added Kemp. “It’s been great. Lots of fun,” Swift reflected.